Lulu and a host of other musical stars are taking part in celebrations to mark the opening and closing ceremonies of the forthcoming 2014 Commonwealth Games. The events will take place at a number of venues, including Glasgow Green and the newly refurbished Kelvingrove Bandstand, and will include live music and special guests. Revellers will also be able to watch all the action from the opening and closing ceremonies at Celtic Park and Hampden live on big screens. Lulu will lead the line-up at Glasgow Green for the opening ceremony, with a host of Scotland’s musicians, including Eddi Reader, James Grant, Rab Noakes, Sarah Hayes, Roddy Hart & the Lonesome Fire, Emma Pollock and RM Hubbert. Visitors will also be able to enjoy the very best Scottish food and drink at Glasgow Green with Scotland’s finest ingredients being showcased at a food village. 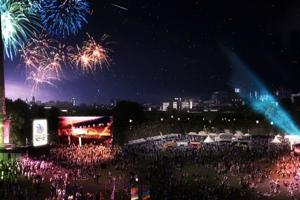 The closing ceremony celebration will give everyone a chance to relive the highlights of the Games in an enormous, outdoor occasion, with Treacherous Orchestra leading a party on Glasgow Green, along with surprise and special guests to see out the Games in style. The recently reopened Kelvingrove Bandstand will be the focus of celebrations in the west of the city, with an opening ceremony party featuring indie pop band Belle and Sebastian. The band was instrumental in calling for the £2.1m refurbishment of the historic bandstand. The closing ceremony at the bandstand opens with a new commission from Glasgow Improvisers Orchestra, performing with Tam Dean Burn and multi-instrumentalist, Corey Mwamba. There will also be classical music from Scottish Opera before the screening of the closing ceremony.